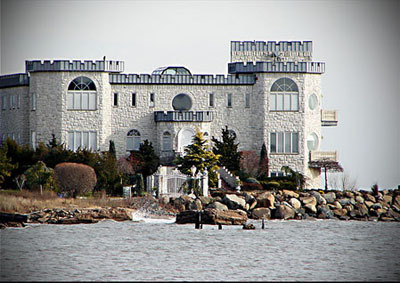 I have a little more information on the "Staten Island Castle by the sea". It is located in a private cul-de-sac on Staten Island's tony Hugenot section oceanfront. The address is 555 Arbutus Avenue, and it was built in 1989.It is about 14,400 square feet. I wish I had more, but the homes in that area are a little bit garish and over the top.